Frederick Douglass once said “If there is no struggle, there is no progress.” As a country, we have made tremendous strides in the health of all populations since this famed abolitionist spoke these words in the mid-19th century. Overall life expectancy has increased and infant death before the age of one has declined. However, health is still experienced disproportionately in the United States. Nearly twenty years ago, April was established as National Minority Health Month to encourage health and health equity partners and stakeholders to work together on initiatives to reduce disparities, advance equity, and strengthen the health and well-being of all Americans. In the U.S., racial and ethnic disparities (or inequities) in preterm birth are worsening. Black women are about 50 percent more likely to give birth prematurely compared to other women and their babies are more than twice as likely to die before their first birthday compared to babies born to white women. This stark reality signals the need for health equity, which means that everyone has a fair and just opportunity to be as healthy as possible. It also signals the need for healthy moms before, during and after pregnancy. Being healthy across the course of one’s life is essential for having a healthy baby in the future. Most of us recognize the importance of prenatal care during pregnancy. Experts also advise screenings for medical and social risk factors, providing health education, and delivering effective treatment or prevention plans as a set of practices that could improve health prior to conception. Women and men of reproductive age who improve their preconception health can increase their likelihood of having a healthy baby if and when they desire. 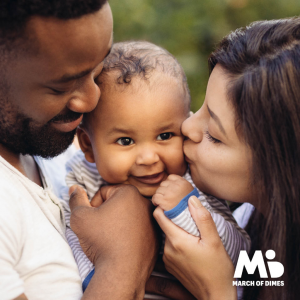 In short, healthy moms and dads can lead to stronger babies. Yet disparities can be stubborn and may require more than simply changing behavior. According to the Pew Research Center, rapid growth among minority populations is projected by 2050. If this trend holds, many of tomorrow’s parents will come from communities that share a disproportionate burden of preterm birth and infant death. Although advances in medicine and technology were likely responsible for much of the improvements in these health outcomes in the U.S. over the years, it is also likely that the collective actions of everyday people has helped us realize that better health is not just for ourselves but for future generations. Looking back on this progress can surely help us look forward to what it will take for our babies to continue to grow and thrive. National Minority Health Month is a special occasion for us to acknowledge the struggles that continue to evade us and what’s needed to support future generations.